"An evil entombed for 2000 years... until now." Doctor Elissa Cardell played by Valerie Cruz meets a team of military personnel led by Mack who is played by Cuba Gooding Jr. She briefs the team about their mission which is to extract one particular individual from a site that has been deemed an archeological dig site. The team, along with Doctor Cardell are flown by helicopter to the location where they enter an underground bunker that is several levels below the surface of the desert. During the flight to the location Mack starts having flash backs of a fire fight that his team was involved in sometime in the past. When the team arrives at the site they begin their investigation of locating the person they are there to extract from the site. Click who is played by Brandon Fobbs is computer expert who must open various doors by hacking into their individual encrypted codes. Their first encounter with any of the archeological team is with a priest who appears to be suffering from radiation poisoning. Doc who is played by Taryn Manning and the medical doctor for the team is able to get the presets' vital signs stabilized and the team leaves him on the first level with Nickels. After Nickels who is played by Zack Ward gets the elevator operating the team start their descent to the lower level while Nickels remains on the first level to get things back into operation so that they can contact their main base. A malfunction in the elevator nearly plunges the team to their deaths as they descend to the lower levels, however, the emergency brakes for the elevator stop it in time to keep it from crashing into the bottom level. When the team steps out of the elevator into the first room of the lower level they begin finding various members of the archeological team who appear to been exposed to radiation poisoning, a few of them are found dead either by being electrocuted or tangled up in razor wire. Other members of the archeological team appears to be possessed by demon. Doc becomes possessed and is lead away by one demon. Later Yoshi who is played by Stephanie Jacobsen begins having hallucinations of her daughter and finds Doc who leads her away from the team. The team finds a second priest who tells them Doc has been taken to the temple. Finally Dr. Cardell tells Mack a little more than she had to begin with and the team realizes that they are dealing with things related to the book of Revelations in the Bible. 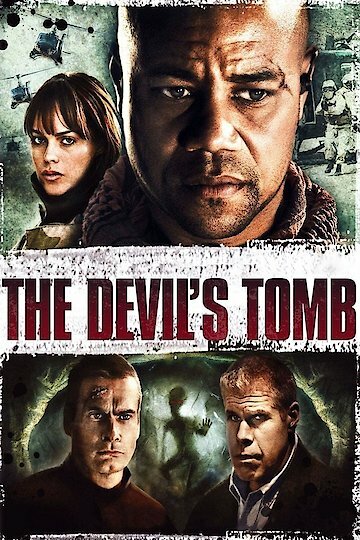 The Devil's Tomb is currently available to watch and stream, buy on demand at Amazon, Vudu, Google Play, iTunes, YouTube VOD online.